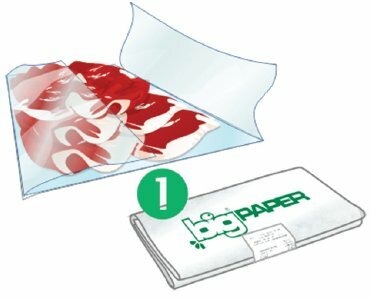 The solution prior to the intervention consisted of a paper-HDPE composite sheet where the food was placed, a sheet in HDPE to protect the food and a paper sack enclosing it all. This was replaced by Big Paper with only one 100% recycled paper component and film in Mater-Bi. This intervention reduced the overall weight by 62% and produced positive effects from a logistics standpoint, also thanks to the introduction of side flaps that make it possible to use the entire surface area. The intervention features optimisation of packaging functions and a subsequent reduction in the materials used. The lesser reduction in water consumption is due to the less than proportional reduction in the paper bulk used in the new packaging solution.